Dr. Seiichi Toki, Plant Genome Engineering Research Unit Leader, Division of Applied Genetics, Institute of Agrobiological Sciences, NARO (NIAS) received the JSPCMB Award for Distinguished Research 2017 from the Japanese Society for Plant Cell and Molecular Biology (JSPCMB). He was awarded for the research on development of the base technology for genome editing in plants. 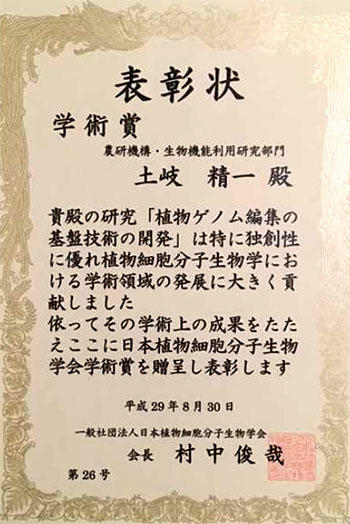 The awarding ceremony was held in conjunction with the 35th JSPCMB Annual Meeting on August 30, 2017 at Omiya Sonic City in Saitama Prefecture.